Our highly professional and qualified staff have been dedicated to getting you the best solution possible for 20+ years. We provide reliable foundation repair services for both residential and commercial properties. Click on the coupon below to print it out and give us a call to schedule your service today! Is your foundation damaged due to years of wear? Are you searching for a professional technician who can conduct repairs and provide effective solutions? 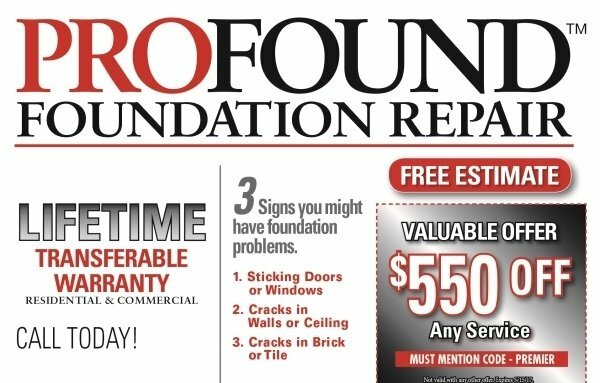 At PROFOUND™ Foundation Repair, we offer a wide variety of methods designed to strengthen and repair your existing foundation. To learn more about our services, give us a call at (214) 440-8870! Proper foundation repair requires skilled, experienced workers, such as those at our Denton County company. Even if you own a brand-new home, there can be design flaws in the foundation and issues with structural integrity that will damage your home in the future. At PROFOUND™ Foundation Repair, we are here to help make sure that your home is safe and secure on a solid foundation. If you own a home or business in Denton County or the DFW Metroplex and are dealing with foundation issues, we can help! You can expect our workers to treat both you and your building with the utmost respect. When you notice warning signs such as cracked walls and bricks, sagging floors, or a leaning chimney, do not delay to get a hold of our technicians for help! We will meet with you to discuss the issues at hand and a practical solution to ensure your home is restored to its proper condition. For a free consultation and estimate, call us now at (214) 440-8870.